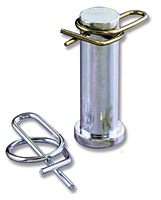 Pivot Point originally invented Rue Ring™ Locking Cotter Pins. Don't be fooled by imitations! Our original proven design and manufacturing specifications ensure proper fit and function. The popular and revolutionary Rue Ring™ Locking Cotter Pin surrounds the shaft and locks itself on, making it one of the safest cotters available today- unlike R Clips and other Cotter Pin Clips. Rue Ring™ Locking Cotter Pins are best used on light to medium applications. Rue Ring™ Locking Cotter Pins install fast without tools. Easy to install and easy to remove! 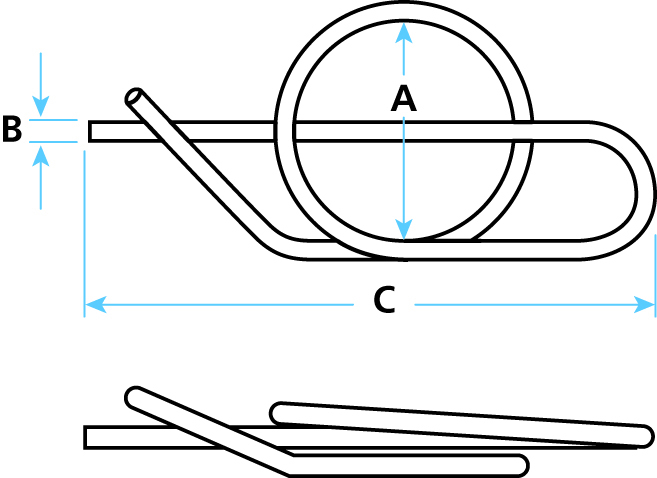 Also known as Rue Cotters, Ring Cotters, Locking Ring Cotters, SureLock Cotters, SureLock Ring Cotters and Ring Clips. Other Cotter Pins available from Pivot Point include Circle Cotters, Hair Pin Cotters, and our other popular Cotter Pin invention- Bow-Tie Locking Cotter Pins. A manual secondary lock tensions the Rue Ring™ tight and dampens vibration. Made of hard drawn MB spring wire, zinc plated or Stainless Steel (300 Series). Pivot Point originally invented Rue Ring™ Locking Cotter Pins. Don\'t be fooled by imitations! Our original proven design and manufacturing specifications ensure proper fit and function.